The Digital Playground takes on a musical theme this year, with a host of interactive art installations, activities and short films exploring the world of digital sound and music making. At the centre of our Playground will be Illumaphonium, a multi-player musical sculpture that ripples with ever changing patterns of light and sound. 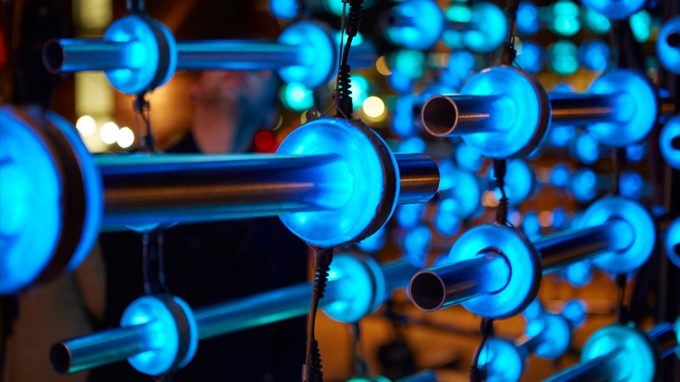 Created by musician and inventor Michael Davis, this giant one-of-a-kind instrument is made up of more than two hundred illuminated chime bars, bringing people together for a fun and spontaneous shared music making experience. Sorry, online booking is not currently available for this event.